When tarot and numerology are combined you gain a reading with deep insight into the personality of the individual. The symbols may not be in total agreement but each tarot card is representative of a number and therefore a numerological reading is practical and effective. Many of us are seeking additional guidance in life and this is certainly one of the means available to gain that guidance. Get your free online Tarot Card Numerology Reading today. Both Tarot and numerology are very popular means of divination. The life path and destiny numbers which have been determined through a calculation based on the date of birth are also associated with a tarot card. Tarot card numerology readings interpret your personality in detail both the positive and negative and determine the ruling planet. This provides insight into your character and aids in determining areas where you may need to make improvements. It is a fact, although most of us were not aware of it, that the science of numbers is in fact related to the sequence of the tarot cards numerologically. Each card in the tarot is strongly associated with the appropriate number. These numbers are based on the numerological principles and represent a spiritual growth process that ranges over the numbers one through nine. 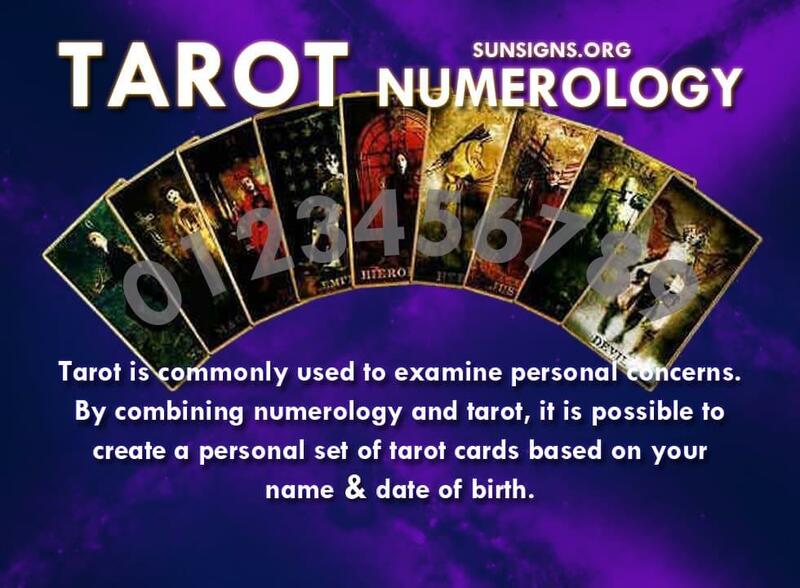 While the tarot is commonly used to examine personal concerns through a reading it is possible to actually create by combining numerology and tarot a personal tarot cards set based on your name and date of birth. If you were to use this personal set of cards you would have a very different reading. As one example in this set only the growth cards ever change. While most readings focus on those things that come and go in life, the cards in the personal deck would represent factors that will be with you throughout life. Most of us are very used to getting what we want in our lives. This would be no exception. We’re all looking for means to emphasize our virtues skills and eliminate our flaws. This type reading because it is very detailed on the personal side can be very helpful in way. With the 78 cards in the Tarot, each of which has a meaning derived from the study of numerology it is the number on the tarot cards which reflects its numerological important. With the minor arcana as an example cards reflect feelings present in our everyday life in ongoing events. The major arcana cards are more inclined to be representative of attributes related to the mundane: the spiritual, financial, familial matters and more. It is through the combination of meanings of the numbers that one is helped to achieve a deeper understanding of numerology with the use of the tarot cards.